To help students learn more about math while doing fitness activities. See video below for a visual demonstration of this idea. Students are in groups of three. 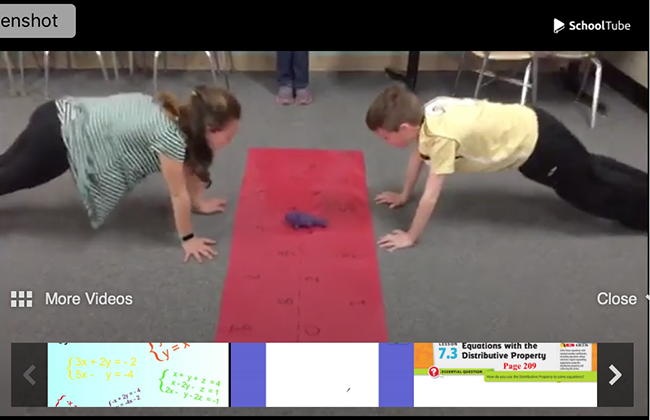 Two students are in a push-up position on their side of the math mat. The third student performs a wall sit and reads/shows a math problem to the other two students. The two students must hit the correct answer with their hand and then grab the rubber fish (or any object of your choice) in the middle of the mat before the other student gets it. If the answer is a double digit number, then they have to touch both digits before grabbing the rubber fish. Perform 2 math problems and then rotate positions. Group students based on math ability so the game is fair. Whoever gets the math question correct gets to keep the card. Each card is worth 1 point. Students can keep track of points based on the number of cards they earn. Submitted by Chance Condran who teaches at Halifax Area School District in Mechanicsburg, PA. Thanks for contributing to PE Central! Posted on PEC: 1/16/2019. Viewed 13100 times since 5/16/2018. Do you have other ideas to use with the math mat for? What dimensions didnï¿½t you make your mat?